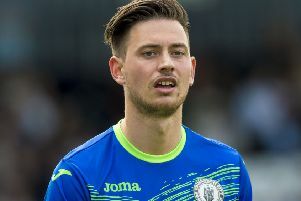 Edinburgh City goalkeeper Calum Antell says a return of three points from a possible nine since the turn of the year is frankly not good enough. The Citizens’ stuttering start to 2019 has come at a cost with back-to-back home defeats from Stirling Albion and Annan Athletic allowing nearest title challengers Peterhead to assume top spot in Ladbrokes League Two, albeit by goal difference. They do, however, still have a game in hand. It’s far from an ideal situation as James McDonaugh’s men attempt to rediscover the form in which they took the first half of the campaign by storm. However, ahead of a the trip north to face Elgin City tomorrow, Antell insists he and his team-mates can have no complaints about recent results. “Our last two performances at home haven’t been good enough and we’ve let ourselves down so we’ll be looking to pick up three points tomorrow,” he said. “We don’t need the gaffer to tell us we haven’t played well. You need to win as many home games as possible so that’s something we need to rectify. We got a good result against Queen’s Park in between those games and I thought that would have got us back on track. “Although it was probably the worst performance of the season last week, I think the most disappointing result was Berwick away. Being 2-0 up with just a couple of minutes remaining and drawing was really hard to take. “We are disappointed with the way we have conceded lately. We want to keep as many clean sheets as possible. We scored four without reply at Hampden the other week so we need more of that tomorrow up at Elgin. “Every team goes through a bit of a rusty spell and it just happens to be that we’ve been a bit inconsistent these last few weeks. Teams are getting better because a few of the sides have brought in some players on loan. We’re finding some of those teams are sitting in a lot more so we’ve just got to find ways to break them down. “I think you saw with the way Annan celebrated last weekend that we are the team to beat. It’s up to us to work opposing teams out. City’s previous visit to Borough Briggs in August ended in a 1-0 defeat. And with another venture north to face Peterhead in just more than a fortnight’s time, the 26-year-old believes it is important the squad get back on the right footing. “February is a massive month for us,” he said. “We cannot afford to be going into a crucial part of the season on a downer. That said, we’d rather be at the top of the league than at the bottom like we have over the last seasons. “The Irn-Bru Cup semi-final is a great occasion for the club and is now getting closer. “Everyone will be going down there in good spirits and looking forward to it. But for us the league is the be-all and end-all as we’re not just looking to get into the play-offs, we want to win it.